OVERLAND PARK, Kansas - RCBS, the leading manufacturer of ammunition reloading equipment for rifles and pistols, will announce several new products at booth #14551 at the 2019 Shooting Hunting and Outdoor Trade (SHOT) Show in Las Vegas, January 22 to 25. In addition, Pro Shooter Bryan Sikes will be on hand to meet and greet guests and talk about reloading for competition. Swing by the RCBS booth (#14551) at SHOT Show 2019 to see the new products and meet RCBS Pro Shooter Bryan Sikes. A top competitor on the Precision Rifle Series circuit, Sikes grew up shooting and hunting. A 12-year career in the military started a fire for competitive and long-range shooting. Sikes stoked that fire after retiring from the military by competing in PRS and working as a gunsmith for GA Precision. He will be in the RCBS booth from 3:00 to 4:00 p.m. on January 22, 23 and 24 to talk about competing, reloading and the new RCBS product offerings. First up is the RCBS VLD 3-Way Cutter. With a unique two-blade head configuration, the VLD 3-Way Cutter trims cases like a standard cutting tool, but with a twist. In addition to trimming to length, the carbide blades chamfer the case and then deburr it. The 3-Way Cutter attaches easily to both Case Trimmers and Trim Pros and makes its debut with a MSRP of $99.95. RCBS will also debut 450 Bushmaster dies. Demand for these dies continues to grow and RCBS is filling the niche with a 450 Bushmaster Die set. 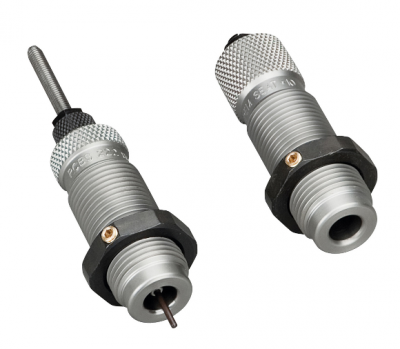 A taper crimp and seating die is also available, that performs both functions in the same operation to save you time at the bench. As always, these dies are made in the U.S.A. with the highest quality die steel. The two-die set is $80.95 and the Taper Crimp Seating Die is $44.95. New RCBS Chamber/Cartridge Gauges will also be on display. These gauges perform double duty. Drop the handloaded round into the chamber gauge and check both chambering, as well as cartridge length. They feature a titanium-nitride coating for corrosion resistance, offer a limited-lifetime warranty and start at $16.95 for popular pistol calibers. Rifle caliber gauges for .223 Rem., .308 Win., and 300 ACC are also available for $26.95. RCBS is the leading manufacturer of ammunition reloading equipment for rifles and pistols, offering reloading equipment throughout the world. To see all of these new products and more visit the RCBS booth #14551 or visit www.RCBS.com.